She was teaching at the University in Pakistan and has held many exhibitions of her paintings both within Pakistan and abroad. College of Art, USA as a visiting artist/lecturer in 2004. Currently she is Systems Manager for Art at Beaconhouse School System (BSS). Having a keen understanding and appreciation of her country’s rich cultural heritage, her eye-catching work communicates the different traditions of Pakistani society in a unique artistic style. 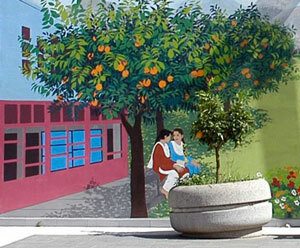 Her mural was created in memory to the journalist Maria Grazia Cutulli.